Invited to be members of the audience for the 2008 Martha Stewart Halloween Special, broadcast LIVE from her New York Studios, myself and my 3 guests had only one requirement. We must come dressed as statues. Initially this requirement might sound easy enough, but if you really think about it, most any figure can be a statue if they remain completely still. This makes it harder to be clear that your costume is a statue without visual clues like monotone coloring, etc... or you are a famous statue, like the "Statue of Liberty", etc... I knew those costumes would be taken by others in the studio audience for sheer popularity. 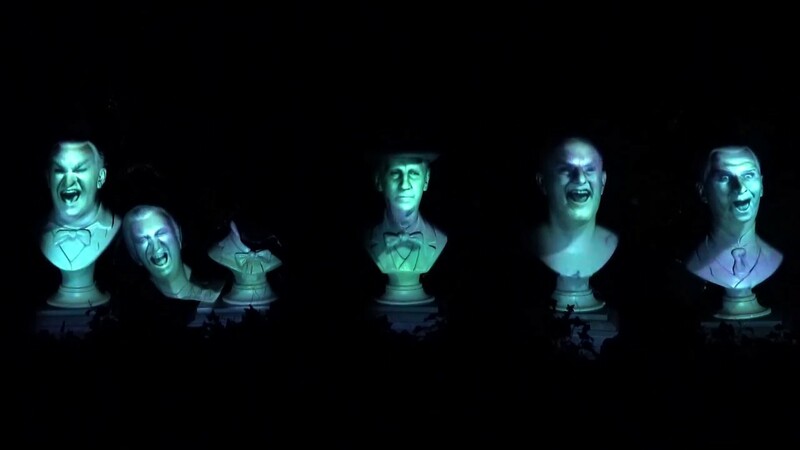 I have a particular fondess for the sort of creepy bust statues you find in a Disney Park's Haunted Mansion, or similarly creepy environment, so I came up with this concept for us to be 4 famous composer busts. I first did some research to discern some basic features of existing composer bust statues. I could only find one other bust statue costume online, and it incorporated a roman column support to hide the rest of the persons body. I didn't like the visual of that, nor did I want something that restrictive as well as not functioning in a seated position. I came up with the "black art" concept that is the final version you see. Next came measurements for all 4 of us followed by thrift store shopping for the required jackets, shirts and accessories. I wasn't necessarily going for authentic ressemblance of each composer as much as creating 4 distinct costumes. I found 3 wigs, and one beard, and I knew that one friend would be using his own hair, sprayed white. Each costume was assembled on a mannequin, but you could enlist a patient friend to help. The jacket and shirt were cut to the desired bust shape, folding and hot-gluing up the cut edges. A slit up the back was cut with wide Velcro being glued into place on the inside of one edge, and overhanging the opposite edge. (side note: I cut about an inch or so from the slit on the back of my jacket which, when pulled together puffed out the front a bit giving it extra shape, which was visually good- but after an hour of wearing it, horribly uncomfortable. I was terrible pain by the end of the evening, so learn from my experiment). I also used a hot glue gun to adhere the shirt to the jacket, along with any accessories like a tie or ruffled scarf, making sure everything was in place and one "solid" piece with no discernible flexibility or movement. Several coats of basic white flat-finished "ceiling" paint were then applied to the outside of everything to stiffen and further immobilize each costume. Completing the bust effect were our t-shirts. Long-sleeve black t-shirts with opaque heat-transfers of the bust pedestal design I created in Adobe Illustrator. Each pedestal varied a little and was placed in a location that aligned with the bottom edge of the bust jacket, with enough overlap before using the heat press. Download a PDF with all 4 composer bust pedestals and 2 blank designs for you to use here (6.4MB). Our makeup was white with two shades of gray for shading. We wanted to look statuesque and slightly "caricaturistic". White hair spray and powder was used to fill-in and blend, and was helpful for eye brows. Additionally, "Beethoven" used his natural long hair, sprayed white unlike the rest of us who wore wigs with hairnets to keep them looking tight and relatively solid. The producers at Martha Stewart wanted to see our costumes a week before the show, so we had to complete 2 of them in a hurry, finishing around 4 am. A song came on the playlist that my friend knew all the words to. This video was completely spontaneous, and ridiculous. Enjoy! We had a fantastic reception from the staff at the Martha Stewart Show and thoroughly enjoyed our experience during the LIVE Halloween broadcast, which included a segment where Martha, dressed as Medusa, interviewed me about our costumes. Live TV made me quite nervous, but we had a great time! My birthday is on Halloween, and one of my favorite treats is receiving images and notes from others who've created and reinterpreted this costume idea- including friends of mine! It's flattering and so much fun to see so many others having such a good time all dressed up! It's incredibly surprising, mostly flattering and somewhat annoying to discover this has been re-created commercially, sold by Spirit Halloween/ Spencer Gifts. So much for the non-commercial Creative Commons license. I'd imagine if big name studios aren't able to do anything about the plethora of unlicensed knock-off's, then it's not worth pursuing. If anything, I'm particularly flattered that of the 4 bust costumes I created, they recreated mine/ me! My recommendation is to build this relatively easy costume yourself! Half the fun is in the process- and look how much more awesome you'll look! All I'm asking Santa for at Christmas is a Full Spectrum hobby laser. I've been oh-so-good. This was brilliant!! Very well done! Oh, man, that is good. That is a hands down amazing idea, and you guys pulled it off so well! Thank you! Sorry for any confusion. When cutting the slit in the back of the coat, I also cut and removed about an inch of width from this opening, which allowed me to pull the back of the coat together a little tighter, and puffed out the front side a bit, which looked great, but ended up hurting my back and shoulders quite a bit after an hour. If the coat you are using is larger than your size, it might be okay to do this, but I don't recommend this if it fits properly. Have fun, and remember to share photos with us if use this idea! There's a person who entered George Takei's Facebook halloween costume contest that made a costume very similar to these! I wonder if they were inspired by you? Oh yeah, that could be. I originated this style of bust costume back in 2008, but it seems this is the year everyone has been inspired to recreate it for themselves. I've received many stories and photos from others, including friends in the past couple weeks showcasing their efforts. It's been a real treat, but I hadn't seen that guys costume. Thanks for point me in that direction. Who doesn't love George Takei? Thanks for sharing. We used your template for this year's costume. They turned out great! Yes! You look great- and it's awesome to finally see a female bust! Fantastic work! I'm sure you had a great time. Thanks for sharing! This is great! I love it! I want to make it! Thank you! If you do, take and share photos! I've yet to come across evidence of anyone doing this concept. Who knows? It's more common to find the classic composers as stone busts, so they are interpreted as busts more clearly, I think. With the right execution- and a good group of friends you could pull of something cool!